From heating repairs to air conditioning installation, Quality Air Heating and Air Conditioning is the company to call for comprehensive heating and air conditioning service in Galena, OH. When you’re looking for an HVAC contractor that puts its customers first, you need not look any further than Quality Air Heating and Air Conditioning. We were founded on the idea that our customers are our bosses because without them, we don’t exist. That’s why we work so hard on every job to exceed your expectations and our own standards as well. Call us 24/7 for emergency heating and air conditioning repair or if you have any questions about the services that we offer. Heating is a big deal here in Ohio and we at Quality Air Heating and Air Conditioning understand that you rely on your heater a lot during the winter. Call us today if you need any kind of heating service in Galena, OH. Our technicians can work on a large variety of heating systems including furnaces, heat pumps, ductless mini split heaters, geothermal systems and more. From installation and repair to maintenance and replacement, our technicians can handle any job that you have for them. The extended use that your heater gets during the winter can eventually lead to the development of a wide variety of problems. Whether your system is blowing cool air of it is making any unexpected noises, call Quality Air Heating and Air Conditioning for heating repair in Galena, OH. We have years of experience working on many types of systems and when you need our help we’ll get to your home as quickly as possible, find the problem and take care of it so that you can continue enjoying the comfort of your home. If you want your new heating system to operate properly, you simply have to have it installed by a professional. Quality Air Heating and Air Conditioning is the company to call for your heating installation in Galena, OH. We do more than just install heating systems: we can also consult with you about which type of heater is right for your home and help you pick out the proper size. This is a critical part of the process because if you get the wrong-sized heater in your home it could cause problems for your comfort and efficiency. Call us today to talk with one of our friendly technicians. When it comes to the air conditioning system in your home, you need it to operate efficiently and effectively throughout the hottest parts of the summer. If your air conditioning system is blowing warm air or if you need to have a new air conditioning system installed, call Quality Air Heating and Air Conditioning for all your air conditioning service in Galena, OH. We can work on all types and brands and our technicians are highly trained to provide you with friendly and high quality service, so call today. While do-it-yourself projects are great around the house, repairing your air conditioning system is something that should be left to the professionals. Quality Air Heating and Air Conditioning provides air conditioning repair in Galena, OH for all types of systems. If you aren’t getting enough cooling or if your AC is making any funny noises, call us 24/7 for emergency air conditioning repair. We understand how important your AC is to your comfort, and we work hard to deliver outstanding service on every job. If your air conditioning system has failed permanently or if you’re building a new home and need a new AC system, call Quality Air Heating and Air Conditioning. We offer total air conditioning installation in Galena, OH and we can work on all types of systems. Our specialists can talk with you about the type of air conditioner that you want, and we can also make recommendations as far as the size and type of it as well. Contact us today to speak with one of our friendly Galena, OH air conditioning installation experts. The importance of regular maintenance for your air conditioner cannot be understated. Quality Air Heating and Air Conditioning provides total air conditioning maintenance in Galena, OH. Our maintenance program includes more than just annual tune-ups from our experts: it also includes reduced pricing, extended warranties, priority service and much more. Plus, when you get your air conditioner regularly maintained you should be able to reduce repairs, increase the efficiency of your system, and also extend its life. Call us today to learn more. Eventually, all equipment needs to be replaced. If your AC has come to the end of its life, all you have to do is call Quality Air Heating and Air Conditioning for quality air conditioning replacement in Galena, OH. We can handle all of the details of the replacement so that you don’t have to worry about it. We can recommend a new type of system that fits the size of your home and your budget. Our specialists will install your new air conditioner quickly and with the high quality of service that will allow it to operate efficiently for many years. Commercial HVAC systems get a lot more use than residential systems because they need to keep larger spaces and businesses comfortable all throughout the day. 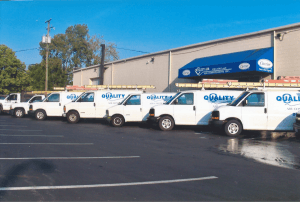 Here at Quality Air Heating and Air Conditioning, we are proud to work with many different businesses providing quality commercial HVAC service in Galena, OH. We can install a brand new HVAC system for your business and we can also repair any issues that you might experience. Call us today to talk with one of our friendly Galena, OH commercial HVAC experts. Most businesses run their heating and air conditioning systems almost constantly in order to keep the interior nice and comfortable. But all this use can take its toll and cause your system to break down. Fortunately, Quality Air Heating and Air Conditioning is here with commercial HVAC repair in Galena, OH. We understand that your HVAC equipment doesn’t always break down when it’s convenient, which is why we’re available 24/7 for commercial HVAC repair. Call us anytime! Installing a new HVAC system in your business is a big deal and it’s a decision that will impact your business for years to come. That’s why you should always get professional commercial HVAC installation in Galena, OH from Quality Air Heating and Air Conditioning. We have the years of experience and training to provide you with quality installation for all types of equipment including cooling towers and chillers. Call us today if you need any new HVAC components installed at your business. Having consistent and efficient heating and cooling in your business is critical to your success. You want to keep your overhead as low as possible and having efficient HVAC equipment is a big part of that. Getting regular maintenance for your heater and AC is a great way to make sure that your system operates as efficiently. Plus, regular maintenance and tune-ups could also reduce the need for repair. Quality Air Heating and Air Conditioning offers a fantastic maintenance program that includes reduced pricing for our members, extended warranties, priority service and much more. Call us today to learn more. Most heating systems have to consume a fuel source in order to heat your home. But heat pumps are able to provide heating to your home without having to burn a fuel. Instead, they absorb ambient heat in the outdoor air and move it into your home. Plus, they can also provide air conditioning to your home as well. If you’re looking for an all-in-one system for your home’s comfort, a heat pump is a great idea. Quality Air Heating and Air Conditioning offers comprehensive heat pump service in Galena, OH including installation, repair, maintenance and replacement for all makes and models. Contact one of our experts today to find out more. The furnace continues to be one of the most popular heating systems in the country because of its efficiency and also because of its consistent heat no matter what the outside temperature is. Quality Air Heating and Air Conditioning is proud to offer our customers quality furnace service in Galena, OH for all types including electric, gas, and propane. Whether you need furnace repair in Galena, OH or if you’re looking to have a new unit installed, let us know and we’ll get the job done with the high quality that you deserve.